It starts before we even got to camp, the bus we were on broken down on the middle of I-20 and we spent about 1 hour sitting on the side of the road under an over pass waiting for another bus to come pick us up. After we finally boarded the second bus guess what? It broke down also about 20 minutes later. Well after boarding a 3rd bus we finally made it to Rock Eagle. I should have understood the bus situation. It was a warning from God trying to keep us away from the camp. God knew bad stuff was going to happen! After we got there we settle in our bunks and meet the counselors that were in charge of us. I don’t remember much but only that we had a very strict counselor and got yelled at often for breathing the wrong way. It seemed that all the other counselors were very loose and let their students do just about anything they wanted. Another memory I remember was that some other students from another school kept wanting to fight students from our school. They started throwing sand in people’s eyes randomly and running off. I remember several of the guys in our cabin got attacked, I think Jason Brasswell was one of them. The last memory was the best. We had heard from the counselors that the movie Friday the 13th was partially filmed there and like you should tell a bunch of 5th graders that anyway it added to the scary we got later in the week. 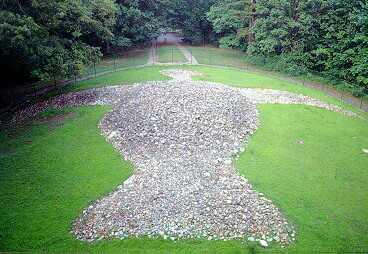 One day we decided to go look at the famous pile of rocks made by indians long ago (Rock Eagle) They school drove us by bus to the big pile of rocks and after we were done they decided to let us all walk back to camp through the woods by ourself with no adult supervision. I was in the back part of the group and several of us got lost on the way back as it started to get dark. I remember freaking out as a kid thinking Jason was going to come out and get us with his chainsaw. Finally we found our way back to camp and then we got yelled at by our super strict counselor for being late. This was in the days before 2nd graders had cell phones, heck this was before cellphones weighed less than 15 pounds and you had to carry them in a big back pack so we didn’t have them to call for help or to call for our parents to come get us from the awful bad camp. Makes me wonder if the person who invented the cell phone was a 4-H camper with us. So, just wanted to say thanks Rock Eagle and thanks 4-H club for all the great memories you gave me. Let’s do it again sometime real soon… NOT. Well all joking aside, we survived just fine and that which doesn’t kill you makes you stronger. If you have any great memories of your experience at Rock Eagle please feel free to add comments! This entry was posted on Monday, April 19th, 2010 at 11:54 am and is filed under Religous and Life. You can follow any responses to this entry through the RSS 2.0 feed. You can leave a response, or trackback from your own site. When trying to get somewhere and two different transportation vehicles break down…beware! Bad experiences make interesting stories!